You have likely never heard of phorid flies, also known as coffin flies, because their overtly violent attack methods have only just recently been discovered. If it were not for these unconventional hunting tactics, phorid flies would be like any other type of boring fly. Actually these flies have many nicknames, they are also known as scuttle flies, and more to the point, ant decapitating flies. The reason for the last name listed ought to seem pretty obvious, these flies remove ant heads. But why? Researchers have found that each case of decapitation was incidental and not a deliberate move on the part of phorid flies. Some flies, like fire ant decapitating flies do have a part in ant-murder, but technically the larvae kill the fire ants. For example, these flies will lay eggs inside of a fire ant’s body, once they hatch the flies travel straight to the fire ants head, causing it to pop off. Phorid flies, on the other hand, cannot seem to avoid decapitating ants, it is always an accident with them. This sounds strange, but science backs it up. But there are different species of phorid flies and one species has recently been outed as an ant decapitator. This species of phorid fly is referred to as D. longirostrata. Brian Brown of the Natural History Museum of Los Angeles is likely the only guy in the world who has had a lifelong passion for the study of phorid flies. Brown has traveled to exotic locations that are highly populated with phorid flies only to leave ant corpses near their living areas. Brown was always curious about the hunting methods employed by phorid flies. When Brown planted these corpses he did not expect to arouse much activity, but a species of phorid fly showed up. The species called D. longirostrata began to move close to Brown and his colleagues, but they were only interested in pulling the heads of the dead ants. In fact, some of the phorid flies even exposed the brains of some of the ants. The brains were eventually eaten and the killing area was used to lay eggs, which is a pretty sick insect behavior. Had you ever spotted a phorid fly? 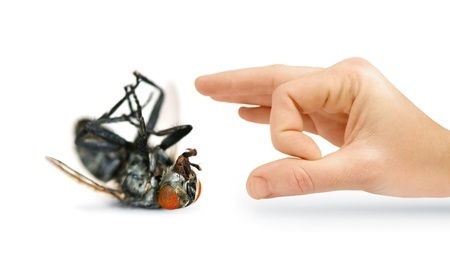 Have you ever heard of another type of insect that gruesomely kills its prey?